In the plague-ravaged city of Wahib, deep within Ipsica, a mercenary band struggles to learn the truth about a nameless and indiscriminately deadly illness spreading through the populace, and uncover a conspiracy that goes higher than they ever imagined. A mysterious killer called the Temple Shredder stalks women on the streets of Shen Utah, his every murder more gruesome than the last. And on the southern coast of Shenmadock, a traveler and her companions uncover evidence that Ipsica may be preparing for war. Over everything hang rumors of magic, a myth from earlier days. Against a backdrop of suspicion and betrayal, the Harbinger rises. 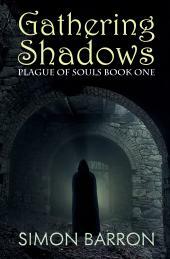 The eBook Gathering Shadows is the first in the Plague of Souls trilogy and is available now. You can like Simon Barron on Facebook or follow @SimonJBarron on Twitter to keep up with news and reviews.